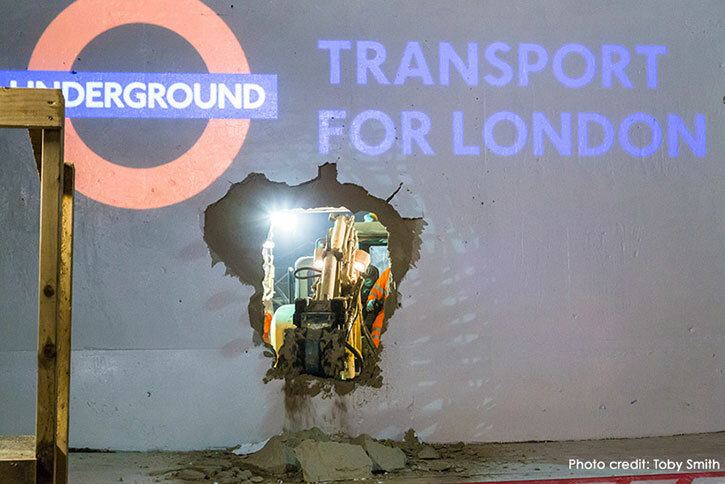 A major milestone at Victoria Tube station has now been reached as part of its £700m upgrade, with a final tunnelling breakthrough. The 300 metres of new tunnels will link the brand new North ticket hall with the existing South ticket hall, which is being doubled in size to make journeys less crowded for the growing number of customers using the station. Taylor Woodrow BAM Nuttall engineers tunnelled through the final metre connecting the north and south tunnel schemes on Monday afternoon, completing the key section of this complex three-year tunnelling project. The work was completed behind-the-scenes with no disruption to Tube customers, despite the fact that in certain places it was carried out less than 30cm away from operational Victoria line platforms. Victoria station is one of the busiest in London and is used by over 80 million customers each year – more than Heathrow Airport. A radical £700m transformation, set for completion in 2018, will increase the size of the station by 110 per cent and will bring step-free access to Victoria for the first time in its 147-year history. Along with nine new escalators, new lifts and step-free access to all platforms, a new underground North ticket hall is being constructed at the junction of Bressenden Place and Victoria Street, and is set to open in late 2016. The new North ticket hall will significantly cut journey times for passengers who exit towards Victoria Street. David Waboso, London Underground’s Capital Programmes Director, said: “This unique and tricky phase of the tunnelling project has stumped people for decades. Now, thanks to the hard work and dedication of LU and our supply chain with some of the best engineers in the business, it has been successfully completed, all while keeping this busy and essential station open to the public. The upgrade of Victoria Tube station is one of a number of major projects being made possible through a loan from The European Investment Bank (EIB). The EIB has agreed to provide a 35-year loan of £1bn that will support the upgrades at Victoria and Bank Tube stations, as well as the track renewal programme. The new tunnels at Victoria have been constructed in challenging ground conditions, through fast-moving gravels and sands less than 30cm away from the Victoria line and within 60cm of the District and Circle lines. Safe tunnelling through the site – which is densely populated and borders two Grade II listed operational theatres – has necessitated innovations in construction engineering. Three thousand cubic metres of ground were excavated by hand in order to stabilise the ground and protect nearby assets. To find out more about the Victoria Station Upgrade, visit the TfL website here.